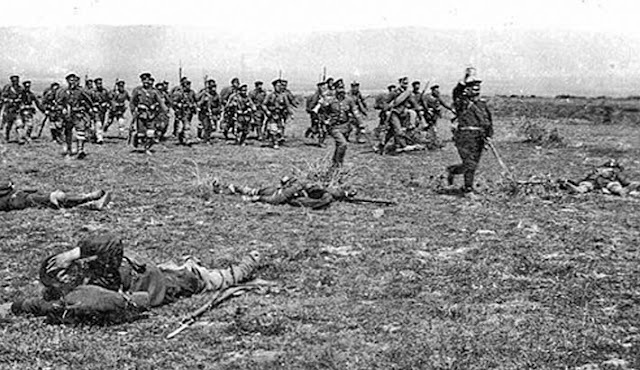 On October 17, 1912, following the example of Montenegro, their smaller ally in the tumultuous Balkan region of Europe, Serbia and Greece declare war on the Ottoman Empire, beginning the First Balkan War in earnest. Four years earlier, a rebellion in Ottoman-held Macedonia by the nationalist society known as the Young Turks had shaken the stability of the sultan’s rule in Europe. Austria-Hungary had acted quickly to capitalize on this weakness, annexing the dual Balkan provinces of Bosnia and Herzegovina and urging Bulgaria, also under Turkish rule, to proclaim its independence. These actions quickly upset the delicate balance of power on the Balkan Peninsula: Ambitious Serbia was outraged, considering Bosnia-Herzegovina to be part of its own rightful territory due to their shared Slavic heritage. Czarist Russia, the other great power with influence in the region—and a strong supporter of Serbia—also felt threatened by Austria’s actions. By the spring of 1912, Russia had encouraged the cluster of Balkan nations—Serbia, Bulgaria, Montenegro and Greece—to form an alliance aimed at taking control of some or all of the European territory still occupied by the Ottoman Empire. Though often at odds with one another, the disparate Balkan peoples were able to join forces when driven by the singular goal of striking at a distracted Turkey, by then ensnared in a war with Italy over territory in Libya. Montenegro declared war on October 8, 1912; Serbia, Bulgaria and Greece followed suit nine days later. The outcome of the First Balkan War surprised many, as the combined Balkan forces quickly and decisively defeated the Ottoman army, driving the Turks from almost all of their territory in southeastern Europe within a month. In the wake of Turkey’s withdrawal, the great European powers—Britain, France, Germany, Austria-Hungary and Russia—scrambled to exert control over the region, convening a congress with the belligerent nations in London in December 1912 to draw up post-war boundaries in the Balkans. The resulting agreement—which partitioned Macedonia between the four victorious Balkan powers—led to a peace concluded on May 30, 1913, which nonetheless left Bulgaria feeling cheated out of its rightful share by Serbia and Greece. This led to a Second Balkan War just one month later, in which Bulgaria turned against its two former allies in a surprise attack ordered by King Ferdinand I without consultation with his own government.